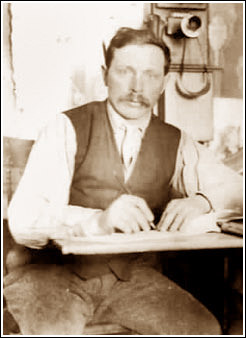 David Strandberg was born to Johan Peter and Johanna Strandberg on September 27, 1875, near the village of Halmstad, Gottland, Sweden, where David and his brother Charles attended the local school. At age twenty, David emigrated to America. David Strandberg first worked in the coal mines and forests of Pennsylvania, and Minnesota before moving to Shelton, Washington. At Shelton, David learned the skills of a high-line logger and became adept at rigging and the use of the gin-pole, skills directly transferable to the placer gold mining technology of the day. He did not, however, confine his learning to the woods. In Seattle, David attended Wilson's Business College where he learned the value of systematic record keeping, a valuable skill that was applied in later years during the management of a small but complex mining corporation. In 1898, David and his brother, Charley Strandberg, responded to the news of the Klondike gold discovery by taking passage to Alaska. The men crossed Chilkoot Pass to the Klondike with hundreds of other gold seekers. On this grueling trip, a twenty-three year old David and his tall good-looking brother, both men strengthened by work in the mines and woods, minimized their expenses by helping others haul freight up the steep trail. Because of their previously acquired skills and a lot of hard work, David and Charles acquired working interests in valuable Klondike claims. The 1902 Golden Cleanup Edition of the "The Dawson News" (page 44) reports that David Strandberg and partners Alex Matheson and Jim Lund mined on the left limit of #5 Below Discovery within the Dominion Creek subdivision of the greater Klondike Mining District. According to the brief published account, the Strandberg partnership mined the claim, originally located in 1898, "with large cars to carry pay from the face of the open cut along a 100 yard rail track to sluice boxes placed in the creek." Although the pay streak on Dominion Creek was not nearly as rich as those found on Eldorado or Bonanza Creeks to the north, ground immediately adjoining David's claim yielded a 20 ounce gold nugget, one of the largest found up to that time in the Klondike District. There was a notable Swedish contingent in the Klondike. This contingent included two young women, Jenny Johanson and her younger sister Hilma, immigrants who joined their uncle Girard and his wife in Dawson City in 1904. In 1905 David and Charley Strandberg and the Johansons left the Klondike for the Fairbanks, Alaska, gold camp discovered only three years before. Shortly after that, Girard commenced mining ventures with the Strandberg brothers. In 1908, Jenny Johanson married David Strandberg. At Fairbanks, David and Charley acquired good ground in the Ester Dome area, where they operated as Strandberg Brothers on No. 3 Below and nearby claims. A contemporary photograph shows a neat operation, with gravel ready for summertime washing and stacks of wood to feed the always-hungry steam boiler. David and Jenny's oldest child, Harold David, was born at Ester in 1909. Olga Virginia was born in Fairbanks a year later. By 1910, word of the 1908 gold discovery of Beaton and Dikeman in the Iditarod River Basin caused the last of the great Alaska stampedes to the diggings at Flat and Discovery. David, Jenny, Charles Strandberg, Girard Johanson and his wife, decided to chance the new Iditarod district, arriving in Flat in the spring of 1911. Apparently the Strandberg-Johanson party had sufficient assets to acquire valuable claims and commenced productive mining near Flat. An oft-told mining tale of the Flat district, with a probable basis in fact, tells that the party had an opportunity to buy into the bonanza Marietta claims on Flat Creek, but Charley Strandberg lost their stake in a poker game on the way to make the payment. Something evidently did happen to split the brothers' partnership, as shortly after the group arrived in Flat, David began to mine with a man named Johnson in a high-line scraper operation on Flat Creek. Reportedly Jenny Strandberg did not forgive her brother-in-law. Her reaction was predictable; doubtless any wife trying to keep a young family clothed and fed in remote Flat would have had problems with such male foolishness. Regardless, the breech appears to have been almost healed in one generation: David's son Odin met and befriended Charley years later and in the following generation, Charley's grandson, C. B. Bettisworth, Jr., and David's grandson, James Strandberg, shared an architectural practice in Fairbanks and could joke about the story. Three more children were added to the David Strandberg family in the early years at Flat. William John, "Bill;" was born in 1912, Theodore Roosevelt, "Ted;" in 1913, and Edward Odin, "Odin;" in 1915. David also acquired rich ground on the Upgrade claims above the Marietta claims at the head of Flat Creek, where he mined with a large crew of men. At about this time, David was photographed at his rolltop desk, piled high with books and catalogs, and a Victrola on one corner on top. A vivacious Jenny posed (ca 1914) with her dog team and children Olga, Bill and baby Ted, at about the same time. Operations slowed down during the World War I years at Flat, but David continued to do well at mining, and one last child, Linnea Genevieve, was born there in 1918. "Dear sir on my away home i ves thinking tha it would bi better for mi to paid to you some Rent on you dich than to bother with Fox Dich . . . i know it would put you aut by letmi to use Dich but i would paid to you $100 of corse it realy would wert to mi more than that but i think it vont put you aut more than hundred dollars and i vanted only for a short time . . . yours very truly (signed Peter Miscovich)." David Strandberg let Peter use his ditch and it saved the Miscovich operation because Peter took out a rich cut before the Guggenheims reneged on a lease that they had promised him. In later years, Peter Miscovich became fluent in English and began his own mining empire. Peter and the rest of Miscovich clan retained a high regard for David Strandberg. David also established a reputation for fair dealings with Alaska Natives. He always believed that their rights must be protected, and he hired them for his mining operations. To back up his beliefs, David joined the Alaska Native Brotherhood, and was proud of his acceptance by Alaska's Natives. In 1923, the Strandbergs continued to mine on the Wildcat Association claims on lower Flat Creek. However, because their older children needed more education than provided by the one-room school at Flat, David and Jenny decided to move their winter headquarters to Anchorage, where it remained for the next several decades. As the older boys grew up and acquired the ability to operate independently, Strandberg operations expanded into other mining districts of interior and western Alaska. In 1930, they began a dragline - bulldozer operation on Candle Creek, working ground formerly by Aitken's Kuskokwim Dredging Company. In 1933, David acquired ground on Bear, Cripple, and Colorado Creeks in the Cripple Creek Mountains where he began to operate as the Cripple Creek Mining Company, later to become Strandberg and Sons. Father and sons opened other mines: at the platinum-bearing Clara Creek near Goodnews Bay, at Tofty near Manley Hot Springs, Candle Creek near McGrath, and on Indian Mountain near Hughes in the Koyukuk district. The Strandbergs looked closely at one hard rock operation: the high-grade Nixon Fork gold deposits east of McGrath, but backed out after a systematic effort to find more ore at the property proved too costly. David Strandberg was a master of ground-based winter logistics, but he quickly perceived the value of aviation in supplying his camps, using larger and more powerful aircraft as they became available. Stinsons, Ford Tri-Motors, and finally the Douglas DC-3's flew in supplies to Strandberg and Sons at remote mining camps. In 1938, an opportunity arose to participate directly in the aircraft industry. W. E. Dunkle, fellow miner and president and chief shareholder in Star Air Lines, sold his shares to Strandberg, who assumed control of the company for several years. The company ultimately evolved into Alaska Airlines. David's investment in Star Air Lines was symbolically a tribute to the bush pilots who risked their lives and planes to save his son Odin's life after a mine accident in Flat in 1930. As time went on, David Strandberg's sons assumed more of the operating responsibilities of the company. Oldest son Harold was made vice-president of Strandberg and Sons, Inc. in 1937. Harold and his younger brothers Bill, Ted, and Odin all had been taught sufficiently well that they could run complex and remote placer operations. One of the Strandberg daughters stayed within the larger Alaska mining family. Olga, the oldest daughter, married well-known mining engineer Larry Doheny and assisted him throughout his career. The youngest daughter, Genevieve, attended the University of Washington, married Oscar N. Kuntz (who was in the timber business), and did not return to Alaska. In Anchorage, David and Jenny Strandberg became highly regarded pioneer citizens of the community. The Strandberg family home and office was at 926th Fourth Avenue. Jenny was active in civic affairs and her garden was one of the cities best. David proudly drove the few streets of Anchorage in a big Pierce-Arrow and occasionally had to be reminded by Anchorage's lone policeman to refrain from taking his lane in the center of the road. In 1949, David suffered a stroke and quickly afterwards, a fatal heart attack. Jenny Strandberg died of heart failure in 1951. Alaska's placer gold mining industry experienced a profound decline in the years following World War II. The deposits and districts that were discovered during the Alaska-Yukon Gold Rush were depleted and operations became increasingly expensive, largely due to the fixed price of gold. Territorial Days were coming to a close and Alaska was moving in other directions. The extensive Strandberg mining holdings remained intact during the transition from territory to state, but the family was devastated by the deaths of Bill in 1963 (who was tragically killed by a black bear north of Fairbanks) and Ted in 1965. David and Jenny's oldest son Harold entered public life serving two terms in the 1960s state legislature. In 1968, Harold was appointed Commissioner of Public Works by Governor Walter J. Hickel. Harold also faithfully served for many years on the Anchorage School Board. After graduating from Colorado School of Mines, Harold's son, David H. Strandberg, practiced his mining engineering degree for two years at the Consolidation Coal Company of southern Illinois. He then worked for many years for Standard Oil Company, finally retiring from that firm in 1992. Odin, Sr., and several of the grandchildren and great-grandchildren hold interests in Alaska lode and placer properties and still plan for a reborn Strandberg mining presence in Alaska. The Strandberg family contributed to another Alaska dynasty when it sold land in downtown Anchorage to Walter J. Hickel, who erected the first tower of the Captain Cook hotel there. "He was a miner, that's for sure. . . Dad was straightforward in his business dealings. Putting those mining deals together was an art. He had a facility for making bankable deals. People believed what he said." Which, after all, is one of the best tributes that can be offered.